A friend recently reminded me about a book I once loved but had long forgotten. She's helping me with a couple of my classes while I fly to a very dear friend's wedding. She joked that she would play the role of Miss Viola Swamp so my students would be anxious to see me when I returned. As she explained the plot, it sounded a little familiar but I couldn't place the book. Once I Googled the illustrations, however, all the memories came flooding back. 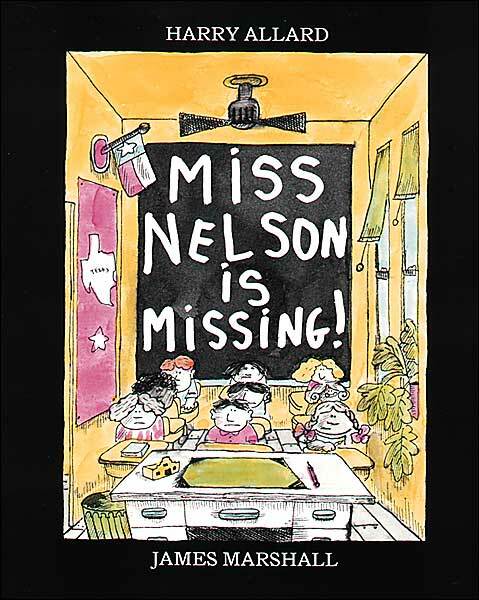 If you didn't recognize it from the picture above, the book was Miss Nelson is Missing! 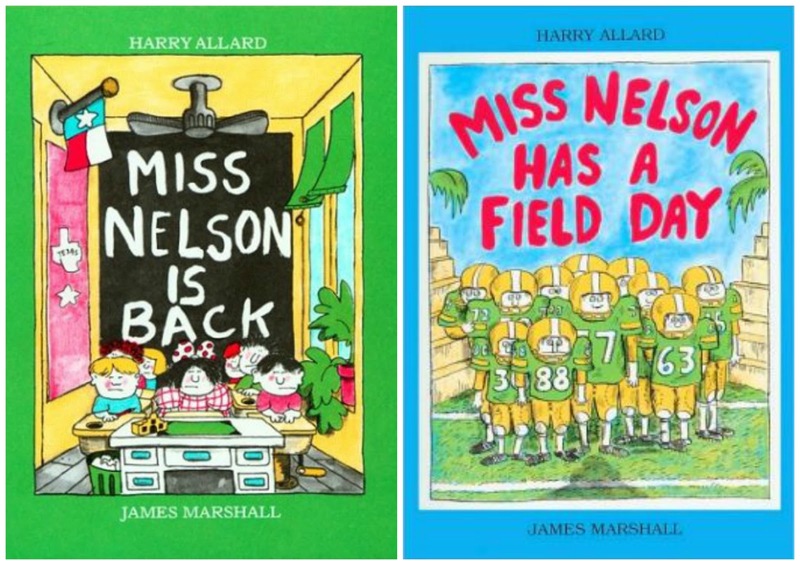 written by Harry Allard and illustrated by James Marshall. How did I forget about this book? I have no idea, but I'm so grateful my friend jogged my memory. The story kind of reminds me of that episode of Saved by the Bell where Mr. Belding's younger brother Rod shows up and all of the students fall in love with him. Luckily for Mr. Belding, Zack and the gang realize Rod is a flake so they're happy when Mr. Belding joins them on their white water rafting trip. Do you all remember the book as well? The story is about lovely Miss Nelson whose class at Horace B. Smedley Elementary School is acting up and misbehaving. In order to teach them a lesson, the class is shocked and horrified when Miss Viola Swamp--"the meanest substitute teacher in the whole world"--takes her place. Spoiler: Miss Swamp is, of course, Miss Nelson in disguise. The story is funny and I love Marshall's illustrations. 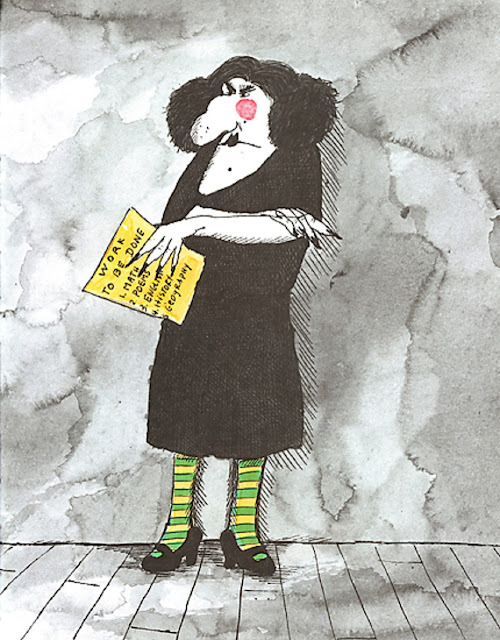 I'm toying with the idea of dressing up as Miss Viola Swamp for my Halloween costume, but worry few will know the reference. The book is one of three (along with Miss Nelson is Back and Miss Nelson Has a Field Day) but was always my favorite. You can now buy them in a set or just pick up your favorite installment. Have you been reminded of books you once loved but had forgotten?